"This uses crushed pineapple, and is much better than the pudding based pies." Combine sweetened condensed milk and lemon juice. Stir well. 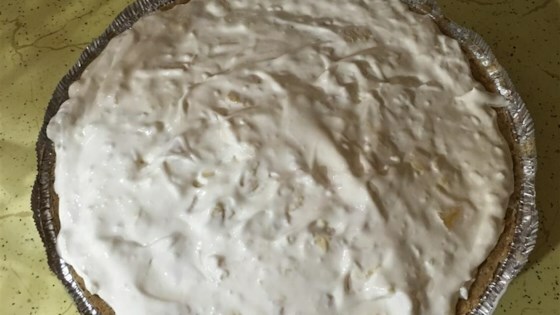 Fold in pineapple and whipped topping. Spoon mix into crust. Chill before serving. See how to make a simple pie using fresh or frozen blackberries. Yummy-Creamy-Quick and Easy! Made me wish I had some coconut on hand to toss into the filling! Note* Could easily have made two pies. Had a bunch left over to eat straight from the mixing bowl! I made 2 pies for Thanksgiving and they were liked so much that I was sent back to the store to get the ingredients to make more and everyone wanted the recipe!! Very good, I added 4 oz cream cheese and this made it creamer and firmer. Very tasty. We LOVE this pie. Whips up so quick and goes just as fast. We like it frozen too. YUMMMMMMMMMMMMMMM. If you can read and follow simple directions, you can make this pie. I'm going to let my 9 year old granddaughter try her hand at it the next time we have it. quick, easy, delicious! i used fat free condensed milk, and cool whip "free" for a low fat treat. I made this recipe exactly like it says and it came out so good. The recipe makes enough to fill 2 pie crusts though. The pie tastes even better the next day.